A constructed deck consisting of 50 cards. Includes further support for the Link Joker clan. Includes 1 RRR and 2 R cards. 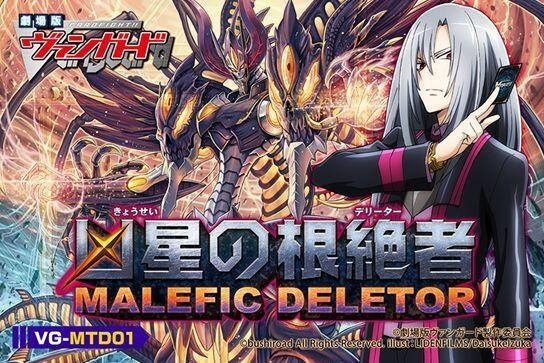 Includes "Deleter" cards used by Ibuki Kouji in the manga and in Cardfight!! Vanguard Movie: Neon Messiah. The official price is 1,000 Yen. "Deleters" have the ability of "Banish Delete"(retiring a unit face-down) and the unexplained ability to "erase" the vanguard, which is being assumed as a win condition. 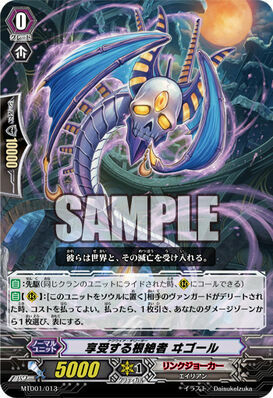 AUTO [V]: At the beginning of your opponent’s ride phase, if your opponent’s vanguard is deleted, your opponent may discard a card from their hand, if they choose not to discard, they cannot normal ride during the ride phase. Q: Can a Deleted vanguard do anything? A: It cannot use the effects written on its ability text. Other than that, it can do a fair amount, for example, other units can ride it, it can attack, and it can be boosted. Twin Drive is also kept. Q: What happens when a vanguard in Legion is Deleted? A: Both cards are placed next to each other, face-down. Both units’ power becomes 0 and both of their effects are lost. However, they are still considered “in Legion.” At the end of your turn, both units are flipped face-up and remain in Legion. If another unit rides, both cards are flipped face-up and placed in the soul. Q: A deleted unit is boosted by a 6000 power unit and attacks an 11000 power unit. If a drive check reveals a trigger and increases the power by 5000, does the attack hit? A: Yes. Only the unit’s written power becomes 0 - other units may boost normally. Critical is not lost, so damage would be inflicted. Q: When “Majesty Lord Blaster” is deleted, is “Bedivere“‘s effect still active? A: Yes. A deleted vanguard retains its name, grade, clan, nation. Q: A Grade 3 unit is deleted. Can I ride a Grade 2 unit, and it return to normal? A: No. It still keeps its grade, so you cannot ride a Grade 2 unit. Q: What happens to a deleted vanguard’s Soul? A: Nothing. You may still Soul Blast for the cost of other units’ effects. Q: A Break Ride unit is deleted. If I ride over it, does its effect activate? A: No. Its skill text is still lost at the moment of ride. Q: Can a rearguard be deleted? A: Since the only targets for deleting are vanguards, a rearguard cannot be deleted. Q: Can I look at a face-down deleted card? A: Yes. Both players may confirm the deleted card at any time. When touching your opponent’s cards, please treat them respectfully. Q: Can a deleted vanguard with [Restraint] attack? A: Yes. Because it loses its ability text, units with Restraint and Lord may attack while deleted. Q: When Delete ends, does that unit’s “when called/ridden” effect activate? A: No. Delete ending is different from being called or ridden. It's definitely interesting. Could totally be broke though if they didn't limit it so much. 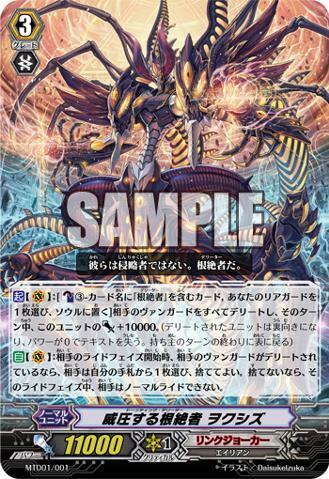 [AUTO](RC):[Put this unit into your soul] When your opponent's vanguard is deleted, you may pay the cost. If you do, draw a card, choose a card from your damage zone, and turn it face up.